Fascination over the letter "y". Why you ask? The intersection and counter parts that form "y" connects two diagonals into one straight line. 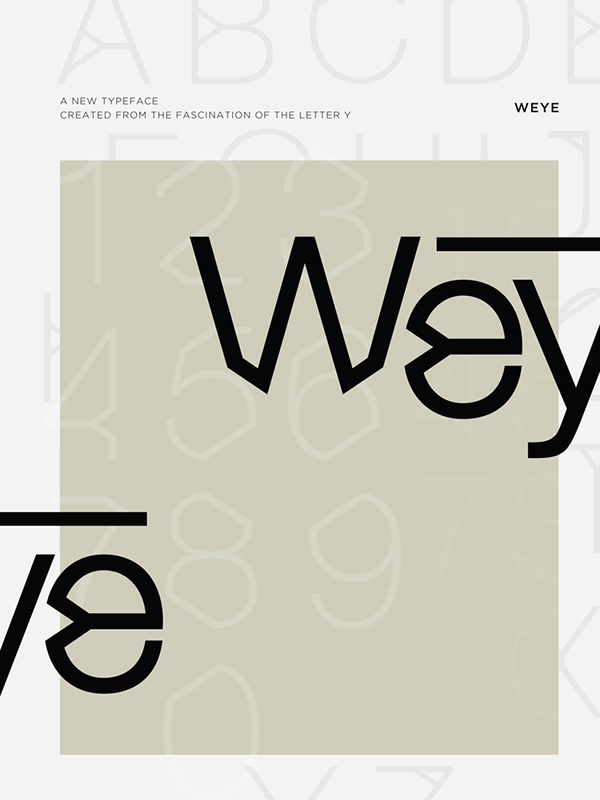 Breaking apart the letter "y" and adding significant pieces, (only when necessary to another letter form) I created a new typeface given the name, "WEYE". It is pronounced exactly like the word "why" but giving it a unique look and a direct emphasis to the letter "y". This typeface is a modified version of Helvetica Neue. There are two different styles and two different weights. Regular shows the parts of the "y" added/modified to the structure of the letter form. Sliced is when those parts are taken off, giving the letter form a unique style. Type design based off the letter "Y". Modified from Helvetica Neue.